Aristolochia (English: /əˌrɪstəˈloʊkiə/) is a large plant genus with over 500 species that is the type genus of the family Aristolochiaceae. 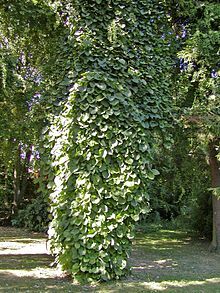 Its members are commonly known as birthwort, pipevine or Dutchman's pipe and are widespread and occur in the most diverse climates. Some species, like A. utriformis and A. westlandii, are threatened with extinction. Holostylis Duch., Ann. Sci. Nat., Bot. sér. 4, 2: 33, t. 5. 1854. Isotrema is usually included here, but might be a valid genus. 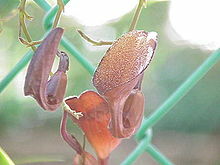 If so, it contains those species with a three-lobed calyx. 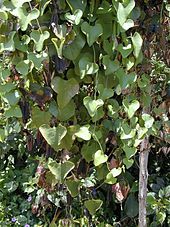 Aristolochia is a genus of evergreen and deciduous lianas (woody vines) and herbaceous perennials. The smooth stem is erect or somewhat twining. 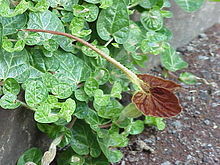 The simple leaves are alternate and cordate, membranous, growing on leaf stalks. There are no stipules. 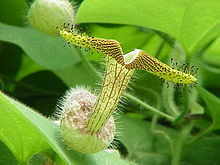 The common names Dutchman's pipe and pipevine (e.g. common pipevine, A. durior) are an allusion to old-fashioned meerschaum pipes at one time common in the Netherlands and northern Germany. Birthwort (e.g. European birthwort A. clematitis) refers to these species' flower shape, resembling a birth canal. Aristolochia was first described by the 4th c. BCE Greek philosopher and botanist Theophrastos in his book [Inquiry of Plants, IX.8.3], and the scientific name Aristolochia was developed from Ancient Greek aristos (άριστος) "best" + locheia (λοχεία), childbirth or childbed, relating to its known ancient use in childbirth. The Roman orator Cicero records a different tradition, that the plant was named for the otherwise unknown individual with the common Greek name Aristolochos, who had learned from a dream that it was an antidote for snake bites. 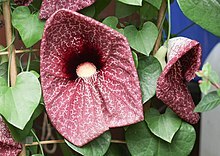 The species Aristolochia clematitis was highly regarded as a medicinal plant since the ancient Egyptians, Greeks and Romans, and on to until the Early Modern era; it also plays a role in traditional Chinese medicine. Due to its resemblance to the uterus, the doctrine of signatures held that birthwort was useful in childbirth. A preparation was given to women upon delivery to expel the placenta, as noted by the herbalist Dioscurides in the first century CE. Despite its presence in ancient medicine, Aristolochia is known to contain the lethal toxin aristolochic acid. The Bencao Gangmu, compiled by Li Shi-Zhen in the latter part of the sixteenth century, was based on the author’s experience and on data obtained from earlier herbals; this Chinese herbal classic describes 1892 "drugs" (with 1110 drawings), including many species of Aristolochia. For 400 years, the Bencao Gangmu remained the principal source of information in traditional Chinese medicine and the work was translated into numerous languages, reflecting its influence in countries other than China. In the mid-twentieth century, the Bencao Gangmu was replaced by modern Materia Medica, the most comprehensive source being Zhong Hua Ben Cao (Encyclopedia of Chinese Materia Medica), published in 1999. 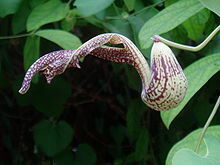 The Encyclopedia lists 23 species of Aristolochia, though with little mention of toxicity. 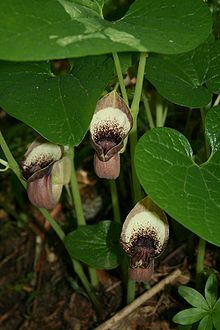 The Chinese government currently lists the following Aristolochia herbs: A. manshuriensis (stems), A. fangchi (root), A. debilis (root and fruit), and A. contorta (fruit), two of which (madouling and qingmuxiang) appear in the 2005 Pharmacopoeia of the People's Republic of China. 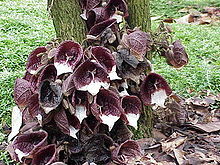 Aristolochia taxa have also been used as reptile repellents. A. serpentaria (Virginia snakeroot) is thus named because the root was used to treat snakebite, as "so offensive to these reptiles, that they not only avoid the places where it grows, but even flee from the traveler who carries a piece of it in his hand". 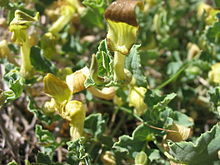 A. pfeiferi, A. rugosa, and A. trilobata are also used in folk medicine to treat snakebites. 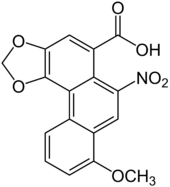 Aristolochic acid was linked to aristolochic acid-associated urothelial cancer in a Taiwanese study in 2012. In 2013, two studies reported that aristolochic acid is a strong carcinogen. Whole-genome and exome analysis of individuals with a known exposure to aristolochic acid revealed a higher rate of somatic mutation in DNA. Metabolites of aristolochic acid enter the cell nucleus and form adducts on DNA. While adducts on the transcribed DNA strand within genes are detected and removed by transcription-coupled repair, the adducts on the non-transcribed strand remain and eventually cause DNA replication errors. These adducts have a preference for adenine bases, and cause A-to-T transversions. Furthermore, these metabolites appear to show a preference for CAG and TAG sequences. In Australia the invasive Aristolochia littoralis is fatal to the caterpillars of Ornithoptera euphorion and O. richmondia and threatens to displace their proper host, A. tagala. ^ "Genus: Aristolochia L." Germplasm Resources Information Network. United States Department of Agriculture. 2009-01-30. Retrieved 2011-01-08. ^ "sometimes with a very disagreeable odour" remarks the Royal Horticultural Society, Dictionary of Gardening. ^ "Jepson Manual: ''Aristolochia''". Ucjeps.berkeley.edu. Retrieved 2013-08-15. ^ "Missouri Botanical Garden". Mobot.org. Retrieved 2013-08-15. ^ Grollman, A. P., et al. (2009) Aristolochic acid nephropathy: An environmental and iatrogenic disease. In: Fishbein, J. C. (ed.) Advances in Molecular Toxicology Vol. 3. Amsterdam: Elsevier. pp 211-22. ^ Health Department and National Chinese Medicine Management Office (ed.). Zhong Hua Ben Cao, 3–460–509. Shanghai Science Technology Publication. 1999. ^ Bensky, D., et al. Chinese Herbal Medicine: Materia Medica, Third Edition. 2004. pp 1054-55. ^ a b Vanherweghem, J.-L.; Tielemans, C.; Abramowicz, D.; Depierreux, M.; Vanhaelen-Fastre, R.; Vanhaelen, M.; Dratwa, M.; Richard, C.; Vandervelde, D.; Verbeelen, D.; Jadoul, M. (February 1993). "Rapidly progressive interstitial renal fibrosis in young women: association with slimming regimen including Chinese herbs". Lancet. 341 (8842): 387–91. doi:10.1016/0140-6736(93)92984-2. ISSN 0140-6736. PMID 8094166. ^ Vanhaelen, Maurice; Vanhaelen-Fastre, Renée; But, Paul; Vanherweghem, Jean-Louis (January 1994). "Identification of aristolochic acid in Chinese herbs". Lancet. 343 (8890): 174. doi:10.1016/S0140-6736(94)90964-4. ISSN 0140-6736. PMID 7904018. ^ Chevallier, Andrew (2016). Encyclopedia of Herbal Medicine. Penguin. p. 171. ISBN 9781465456755. ^ Wood, Michael (March 2004). 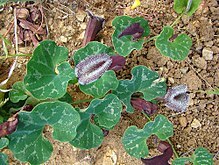 "Dutchman's Pipe (Aristolochia californica)". Yerbabuena org. ^ Freeman-Mitford, A. B. The Bamboo Garden (1896) quoted in Alice M. Coats, Garden Shrubs and Their Histories (1964) 1992, s.v. 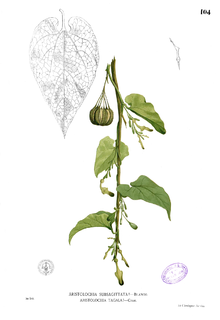 "Aristolochia". ^ Uphof, J. C. Th. (1959). Dictionary of Economic Plants. la Universidad de Michigan. ^ Giovannini, P; Howes, M. R (March 2017). "Medicinal plants used to treat snakebite in Central America: Review and assessment of scientific evidence". Journal of Ethnopharmacology. 199: 240–256. doi:10.1016/j.jep.2017.02.011. PMID 28179114. ^ The names han fang ji (漢防己, Chinese fang ji - S. tetrandra) and guan fang ji (廣防己, Broad fang ji - A. fanchi) had apparently been confused. ^ Vergano, D. Herbal 'remedy' may trigger widespread kidney failure. USA Today April 16, 2012. ^ Cosyns, J. P. (2003). "Aristolochic acid and 'Chinese herbs nephropathy': a review of the evidence to date". Drug Saf. 26 (1): 33–48. doi:10.2165/00002018-200326010-00004. PMID 12495362. ^ Chen, C.; et al. (2012). "Aristolochic acid-associated urothelial cancer in Taiwan". Proceedings of the National Academy of Sciences. 109 (21): 8241–46. doi:10.1073/pnas.1119920109. PMC 3361449. PMID 22493262. ^ Quoted in Coats (1964) 1992. ^ "Bhutan Glory Butterfly". Knowledge Base. ^ "Bhutan Glory (Bhutanitis lidderdalii)". Astronomy to Zoology. 2015. ^ Takeuchi, W (2013). "Floristic records from the upper Sepik of Papua New Guinea: Aristolochia chrismülleriana sp. nov. (Aristolochiaceae), Monanthocitrus paludosa (Rutaceae), and Secamone timorensis (Apocynaceae)" (PDF). Phytotaxa. 114 (1): 51–57. doi:10.11646/phytotaxa.114.1.5. ^ a b "GRIN Species Records of Aristolochia". Germplasm Resources Information Network. United States Department of Agriculture. Retrieved 2011-01-08. 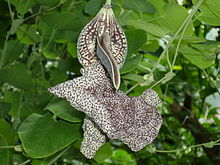 ^ "Aristolochia". Integrated Taxonomic Information System. Retrieved 2011-01-08. American Cancer Society (ACS (2006): Known and Probable Carcinogens (Including Industrial Processes, Occupational Exposures, Infectious Agents, Chemicals, and Radiation). Version of 02/03/2006. Retrieved 2007-NOV-12. Depierreux, M.; et al. (August 1994). "Pathologic aspects of a newly described nephropathy related to the prolonged use of Chinese herbs". American Journal of Kidney Diseases. 24 (2): 172–180. doi:10.1016/s0272-6386(12)80178-8. PMID 8048421. Heinrich, M.; et al. (2009). "Local uses of Aristolochia species and content of aristolochic acid 1 and 2 – a global assessment based on bibliographic sources". Journal of Ethnopharmacology. 125 (1): 108–44. doi:10.1016/j.jep.2009.05.028. PMID 19505558. Stiborova, M.; et al. (July 1999). "Aristolactam I a metabolite of aristolochic acid I upon activation forms an adduct found in DNA of patients with Chinese herbs nephropathy". Experimental Toxicological Pathology. 51 (4–5): 421–427. doi:10.1016/s0940-2993(99)80033-5. Mathew, J. E.; et al. (2011). "Anti-inflammatory, antipruritic and mast cell stabilizing activity of Aristolochia indica" (PDF). Iranian Journal of Basic Medical Sciences. 14 (5): 422–27. Sati, H.; et al. (2011). "Phytochemical and pharmacological potential of Aristolochia indica: A review" (PDF). Research Journal of Pharmaceutical, Biological and Chemical Sciences. 2 (4): 647–54. 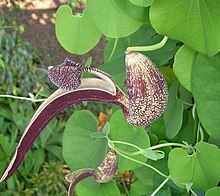 Look up aristolochia in Wiktionary, the free dictionary. 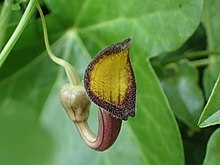 Wikimedia Commons has media related to Aristolochia.